Falling into Fall - Stop staring and start sewing! I saw some trees today that are turning orange! That's a big deal because we're mostly surrounded by palm trees and cactus (or "cacti") here and the seasons (summer, summer, "winter" and summer) turn so quickly that you have to catch it fast. Anyway, we're feeling a little cozier here and I actually had to wear a sweater to the wedding last weekend (the reception was outside and it was lovely). The kids are feeling cozy and crafty too. Here are a few projects Olivia has been pouring herself into. 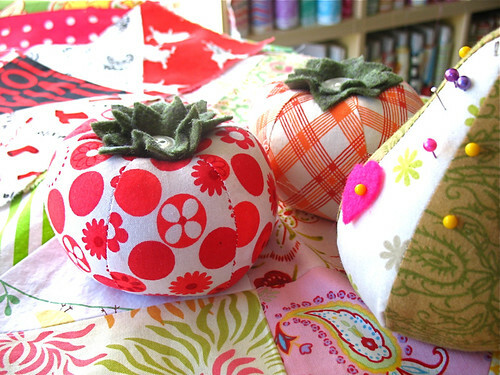 She's crazy about Heather's pincushion pattern (in my store now!) and so far she's made the pear and some tomatoes (the apple and strawberry are next). She's also working on a very colorful quilt which looks like lots of fun. 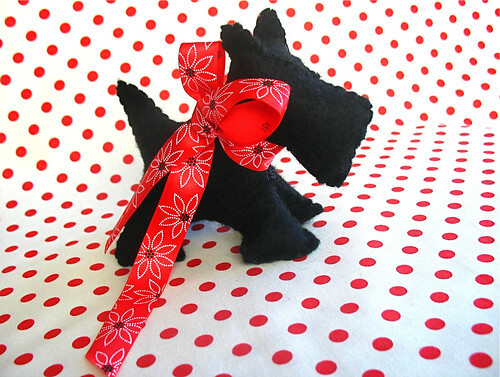 And I love this little plush scotty she made from Jenny Harris's free pattern. If you don't have it go get it! It's really adorable and I'm thinking it would work great as a pincushion too. Wouldn't that be fun on your sewing table (once you get past the fact that you're sticking pins in a dog)? And I have received my latest installment in our Twelve Square quilting bee (which was originally named something that really irked a gal that had a similar group name so in the name of peace we have changed it because we are nice quilting peaceful types of gals with kung-fu grips. Okay the last part is not true.). 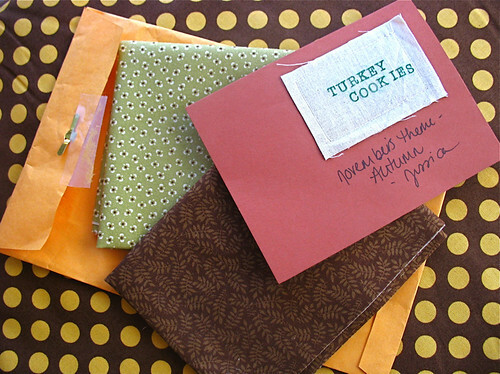 This is from Jessica of Turkey Cookies fame and her theme is "Autumn". I love these fabrics and I am formulating an idea for my block which I hope to implement within the week (I think it involves leaves but I'm not sure yet). And if you love great fabric (snort! don't we all?!) I'm having another huge sale over at Fabritopia. I did some math and realized I'm expecting 108 new bolts in the next few weeks and only have room for around 30 so I need to thin things out here. I've actually talked Joey into letting me put shelves the whole length of the upstairs hallway so that will help. I'm leaving the House by Annette Tatum sale up thru Friday so you get the sale price (6.50) then 15% off that (crazy!). Oh, and I'm giving an Isn't Christmas Jolly? quilt panel with every order over 25.00 until they are gone. Fun!! I hope you're all having a great week!